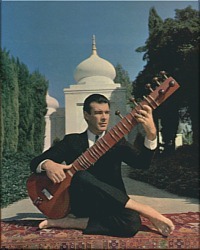 The Beatles' adventures in India and the electric sitar gave pop sitar a campy life of its own. The electric sitar was invented not for amplification's sake but because the true sitar was considered too difficult to master. It soon became a popular effect despite sounding sometimes as convincing as a kazoo imitating a horn. Session guitarists added it to their repertoires, arrangers worked it in as they could, and producers twanged the precarious tightrope of taste. Some country artists even took to it as a previous generation had adopted Hawaii's steel guitar. Whether convenience or scourge, electric, pop sitar reflects the ugly, cheap side of psychedelia. Overall, however, sitar reminds us that the contemplative life is as alluring as ever in this world of harsh beats. See Vinyl Safari for other Indian and Indo-jazz LPs, some partly pop-sitar. Buying: Most pop-sitar LPs are very scarce, even the awful ones, yet LPs with an odd sitar track abound.